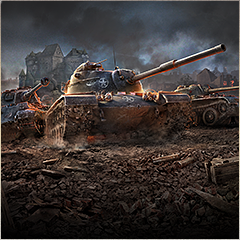 World of Tanks Blitz is a free-to-play mobile MMO action game developed by Wargaming, the award-winning online game developer and publisher of World of Tanks, the smash PC hit now with over 80 million players worldwide! Drawing inspiration from the PC version, World of Tanks Blitz is built specifically for optimal online mobile gameplay and is currently available on your iPhone, iPad and iPod Touch. With an impressive roster of over 90 massive tanks, stunning graphics, and intuitive touch-screen controls, World of Tanks Blitz makes it easy to jump into short, action-packed 7vs7 tank battles no matter where you are! Download Blitz from the App store! Esta página se ha visitado 21 veces.